Fleer added a little excitement in early June with the release of 2004 Fleer Genuine Insider Baseball. What makes this product stand out from the rest is the cards that put the "inside" into Genuine Insider. With this product, not only do you have the initial thrill of seeing what you pulled from a pack, you now have an added chance for great cards by checking the pull-outs contained within the various Insider cards. With this unique in the industry approach, these cards provide the chance for a pull inside of a pull. The 90-card basic set consists of seasoned veterans and young stars. Cards in the basic set feature a clean, standard front design that integrates the player's name, team, position and number. 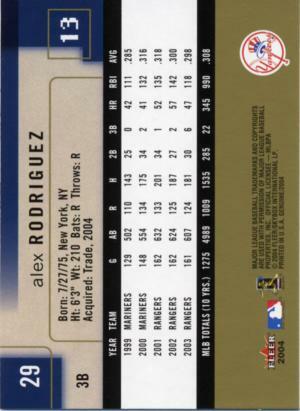 The card backs also follow a standard design of player vitals and career statistics. While veterans and young stars make up card numbers 1-90 in the set, the Genuine Rookie Insider series offers 10 rookie cards numbered from 91-100 that includes John Gall, Kaz Matsui, Merkin Valdez, William Bergolla, Angel Chavez, Hector Gimenez, Aarom Baldiris, Justin Leone, Onil Joseph and Freddy Guzman. Numbered to just 499 each, this limited-number series provides for a quality set of rookie cards for the key new players of 2004. What makes these cards even more interesting is that each of these true rookie cards contains an additional mini card inside - possibly even of a different player. The 10 Mini Rookie cards found inside the Genuine Rookie Insider cards are numbered to 350 and include Greg Dobbs, Jerry Gil, Shawn Hill, Josh Labandeira, Jason Bartlett, Ronny Cedeno, Donnie Kelly, Ivan Ochoa, Mariano Gomez and Ruddy Yan. The 10 Mini Parallel cards of and found inside the Genuine Rookie Insider cards are numbered to only 137. Then, there's the chance to pull one of the 120 Mini Masterpiece cards (numbered 1/1) which can be of any of the Basic, Genuine Rookie Insider or Genuine Upside cards. So, if you pull a Genuine Rookie Insider card, be sure to check what's inside it because the excitement of your initial pull is just the beginning. 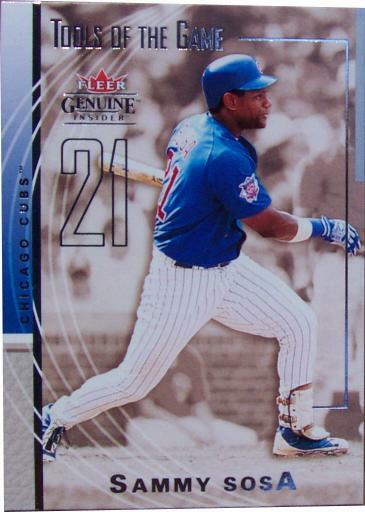 In addition to the Genuine Rookie Insider series, the Genuine Upside series makes up card numbers 101-120 and includes cards of prospects including Rickie Weeks, Chad Bentz, Bobby Crosby, Dallas McPherson, Brandon Watson, Garrett Atkins, Graham Koonce, Chien-Ming Wang, Jonny Gomes, Edwin Jackson, Alfredo Simon, Delmon Young, Angel Guzman, Ryan Howard, Scott Hairston, Edwin Encarnacion, Byron Gettis, Kevin Youkilis, Grady Sizemore and Corey Hart. 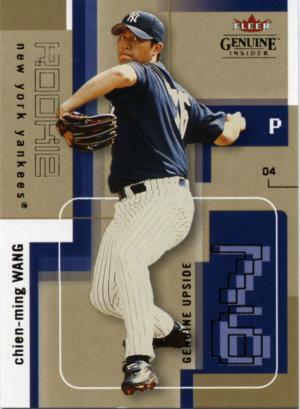 Numbered to just 799 each, this limited-number series provides a good option for getting cards of the up-and-coming stars that you'll want to keep a close eye on during 2004. An example of a Genuine Upside card is shown to the right. At a total of 10 rookie and 20 prospect cards, 2004 Fleer Genuine Insider Baseball offers a nice selection of 2004 rookie and prospect cards. At a rate of 1:14 packs though, you're likely to only get one of these cards per hobby box. If you're interested in a particular rookie or prospect from this set, you may need to look for it through the secondary market such as at a local card shop, eBay or NAXCOM. The basic set is just the beginning with this product since Genuine Reflection parallels numbered to 99 are also available for all of the Basic and Genuine Upside cards (110 cards total). 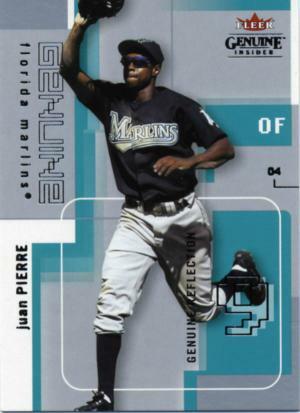 As you can see by looking at the Juan Pierre card shown here, the parallels are easy to spot with their silver-tinted card fronts. In addition, each parallel card is clearly labeled as Genuine Reflection on the card backs - a nice feature of the 2004 Fleer products. No longer do you find yourself wondering exactly which level or type of parallel card you've pulled thanks to the clear labeling used by Fleer. So, now that you've worked on the basic and parallel sets, what about the insert selection? 2004 Fleer Genuine Insider Baseball offers options for collectors interested in these cards as well. 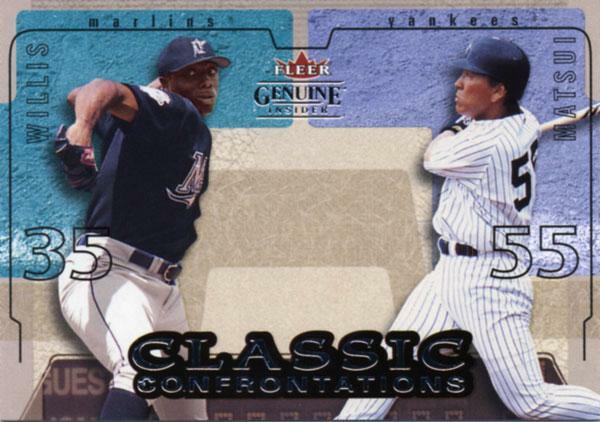 Inserts include Tools of the Game (20 cards) and Classic Confrontations (15 cards) which highlight a significant confrontation from the Big League diamond such as Piazza/Clemens, Pedro/Jeter and more. A few examples of insert cards from this product are shown below. So, you're looking for game-used cards? 2004 Fleer Genuine Insider Baseball offers plenty of potential pulls including memorabilia levels of the Tools of the Game inserts (15 cards) as well as single (15 cards numbered to 400) and dual (10 cards) game-used levels of the Classic Confrontations inserts. Tools of the Game memorabilia cards feature multiple levels of game-used memorabilia including a jersey level (numbered to 250), a jersey/bat level (numbered to 125) and a jersey/bat/cap level (numbered to 75). For the dual game-used levels of the Classic Confrontations, look for a jersey level (numbered to 100) and a patch level (numbered to 10). In addition to these game-used levels of the insert cards, there is a unique 25-card Genuine Insider Memorabilia series which comes in four distinct levels: Jersey (numbered to 250); Bat (numbered to 100); Jersey/Bat (numbered to 50); and Jersey Tags (numbered to 5). Examples of some of the game-used cards included in 2004 Fleer Genuine Insider Baseball are shown below. Don't worry. Autograph cards were not left out of the mix. In fact, there is a 29-card Autographed Insider series that comes in five unique levels: autographed (numbered to amount); autographed jersey (numbered to 100); autographed bat (numbered to 50); autographed opening day baseball (numbered to 10); and autographed cut signature (numbered between 1 and 10). An example of the standard autographed level is shown below. All of the game-used options combine for an overall odds of 1:9 packs or 2 cards in every box while the autograph cards are inserted at an overall odds of 1:18 packs or 1 card in every box. Based on a MSRP of $4.99 per pack, you should expect to pay between $90-$95 for a hobby box. Since a hobby box consists of 18 packs of 5 cards, set builders should find it relatively easy to complete the 90-card basic set. With such a wide-varying selection of memorabilia and autograph cards and an expected 3 cards per hobby box, game-used and autograph collectors will also love 2004 Fleer Genuine Insider Baseball. 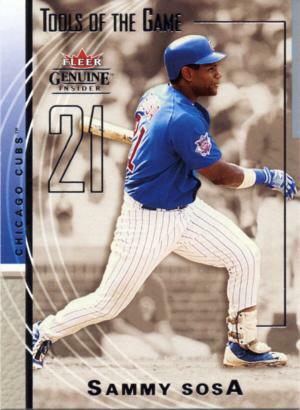 2004 Fleer Genuine Insider Baseball provides a moderately priced option for collecting 2004 baseball cards, including the key new rookies and prospects. Set builders should enjoy putting together a complete basic set while insert, game-used and autograph card collectors have a large number of possible nice pulls from this product. Factor in the various limited-number series and you realize that 2004 Fleer Genuine Insider Baseball covers all the bases. However, what really sets this product apart is its unique card-inside-the-card series which gives you the chance for that special pull inside a pull. Note: About 1/5 of the cards had an issue with minor white streaking or spotting on the card fronts. This issue was only found on the basic cards. While this small issue did not take away from the overall look and feel of the set, you should look for this on any of your key cards. 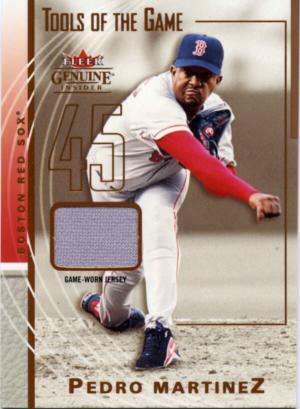 Note about images: Due to the use of a scanner for the cards displayed in this review, some of the stylistic features of the 2004 Fleer Genuine Insider Baseball cards are not easily seen in the images shown above. For example, several of the cards feature reflective lines and text in either silver or gold colors. Those effects are not properly captured by the scanning process. Click here to view a digital image of a sample card if you would like to see the difference.